The Dodge Challenger has been a favorite muscle car since it was first introduced in 1970. The design and power of the Dodge Challenger have been tested and pushed to the limits over the years. 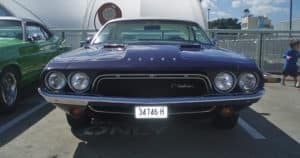 The original design of the 1970 Dodge Challenger could easily be compared to the Plymouth Barracuda. Differences included a longer hood and a slightly larger wheelbase. The 1970 Dodge Challenger came in two top choices, hardtop or convertible. The biggest selling feature, however, was the choice of powertrains. No other manufacturer had offered such a wide range of powertrain options before the Challenger. There were nine powertrain choices in total ranging from an I-6 with 145 horsepower all the way up to a V8 with 425 horsepower. Each of the paint trim levels also had a performance-based name to further promote these exciting power options. The Dodge Challenger saw changes within its first year in full production. The 1971 Challenger model made a few minor changes including upgrades to the taillights and grille. Dodge also released a new coupe version of the Challenger. This year, Dodge gained important market share with their many powertrain and exterior trim level options. Drivers really enjoyed the ability to completely customize their new Challenger. The Challenger was also featured as a pace car in the Indianapolis 500, further contributing to its popularity. Dodge continued to make subtle changes to the Challenger throughout the early part of the 1970s. With emission requirements changing and insurance companies increasing rates because of the added power of the Challenger, Dodge continued to edit for customer satisfaction. In 1974, Dodge stopped producing the Challenger altogether. It did, however, make its way back to production by 1978. Dodge paired with Mitsubishi and released an imported model. From 1978 through 1984, the second-generation Dodge Challenger was imported from Mitsubishi. Surprisingly, buyers did not mind that it was outsourced. They were tired of the low-quality vehicles that were coming out of Motor City at the time. They succeeded with consistent sales for those six years until production stopped again. Dodge did not release its new concept version of the Dodge Challenger until the 2006 Detroit Auto Show. Many of the exterior features reminded drivers of the historical Challenger, but it also featured enough new additions that made it exciting. Its release at the auto show attracted a lot of attention and Dodge decided to go ahead with the build for the 2008 model. In 2008, the Dodge Challenger made a full return. This SRT8 model was optimal in terms of performance, drivability, and design. Dodge has continued to release new models since then and is one of the most respected muscle car manufacturers in the industry today. The Dodge Challenger has taken us on quite a ride throughout its history. Come by Eastgate Chrysler Jeep Dodge Ram to view the latest inventory of Challenger vehicles.